[New for 2013] A new month means a "new" blizzard of the month, though keep in mind you can still get yourself the excellent S'mores blizzard (review). 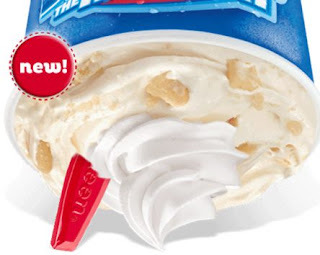 Now if you are like me, you might be going "wait, what, a lemon flavored blizzard?". 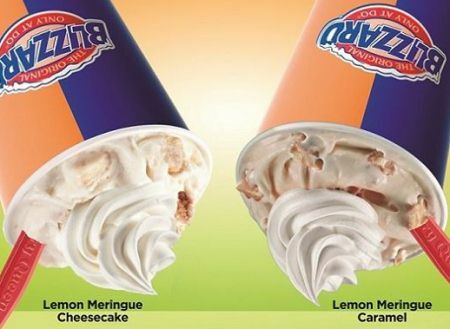 I don't remember there being a lemon blizzard before, but at the same time, they have so many others, maybe I just ignored it.... wait, how long until we see a key lime pie blizzard?? Ok, as always, here's the official shot of the new Lemon Meringue Pie Blizzard. It's Lemon Meringue Pie filling, crunchy pie pieces and whipped topping in creamy vanilla soft serve. Now I would normally hesitate on something like this, but having recently finished the most excellent New Orleans Ice Cream Company's Lemon Doberge Cake flavor (review), I can't help but be excited for this one. Strawberry blizzards are awesome, so I hope that fruity magic happens here too. 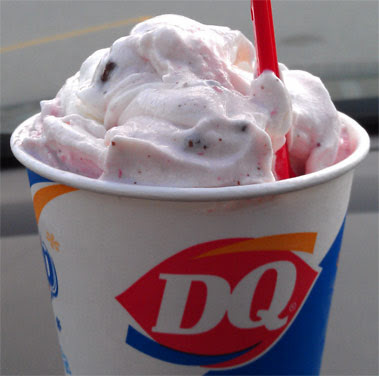 Alright, family in the car, long weekend, it's DQ time. And here is my blizzard. It's a mighty tall blizzard, at least with the whip cream... actually, let's start with the whip cream, talk about an airy, flavorless, mound of nothingness, but anyway... I like the cute little crunch piece sticking out on the right hand picture. It's a half inch square and about an eighth of an inch thick, it's fairly crunchy, and is probably the only saving grace here... nah, I take that back. Look, this isn't a bad blizzard, but my word is it boring. A think a small, select group of people will like this... and that's about it. It's just boring as can be. I wanted that spark that a strawberry blizzard has, or I wanted that full on pie vibe like the pumpkin pie blizzard, but this was just boring. I think if you really like lemon, you'll dig this, but everyone else wouldn't touch it with a ten foot poll. There's just nothing here for the non-lemon crowd. The pie pieces are fine, and there were plenty of them, but what's the point? It's not really complimenting anything here. What a bore.... I started wishing I had asked for Oreos in it just to spice things up. Update: After I posted this, Nick suggested I take a look at the ingredients. Lemonade Concentrate: sweeteners (high fructose corn syrup, sugar), water, concentrated lemon juice, natural flavors. Yup, that's what I tasted! You know what's even scarier though? Whipped Topping: General label declaration, ingredients may vary by supplier. Water, high fructose corn syrup, partially hydrogenated palm kernel oil, contains less than 2% of the following: sodium caseinate (a milk derivative), dextrose, artificial flavor, polysorbate 60, sorbitan monostearate, xanthan gum, guar gum, colored turmeric and annatto extracts. Gross. I want real whip cream!! "Avoid it with a ten-foot poll." I don't think that's how the expression goes. You don't need a pole to avoid something; the point is that you wouldn't touch it with a ten-foot one. And a ten-foot poll, wow, that's a lot of respondents. This seems to be the summer of the lemon so I had hopes for this one :( I may try it anyway because even a bad Blizzard is a good one! Love it. Worked up and worn out. What a great expression. My two year old does this to me daily! I could be incorrect (as rare as that is for me as a woman) but I am pretty sure the whipped topping on this blizzard is meant to be meringue flavored hence the strange taste. I tried some of my sisters and was not a fan although I do like lemon.. For me nothing beats their banana creme pie blizzard which has my loyalty. technically the "whipped topping" can vary by region, so I can't speak for yours, but in my case, there was basically zero flavor and very airy, it was the worst whipped topping I had ever had. 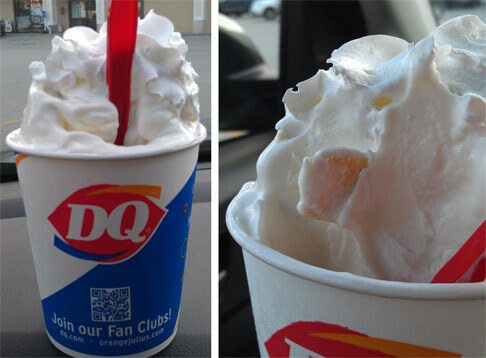 This happens to be my favorite blizzard of all time and I love the meringue flavor to the topping. My second favorite is pumpkin pie blizzard. To each his own, and btw, not a big lemon fan until I had this.